This misalignment, often referred to as TMJ disorder, can also cause some people to clench the jaw and grind their teeth at night. This can lead to facial pain, headaches, discomfort and clicking when biting or chewing, migraines as well as neck and shoulder pain, even back pain. If you recognise any of these symptoms or suffer with these on a daily basis, you will need to see a dentist to treat your problems or refer you to a specialist if necessary. In some cases, the treatment includes wearing a hard plastic appliance at night. This is made to measure and fitted onto your bite accurately, so that when you bite on it, your teeth are in a position where your muscles are relaxed. This also stops your teeth from becoming worn down by grinding and protects them. 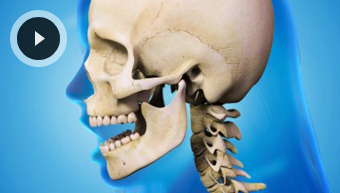 Depending on the origin and severity of your problem, you may need orthodontic treatment or maxillofacial surgery. Other solutions may include replacing missing teeth or adjusting any ill-fitting bridgework that you may have. The important thing to do is see your dentist as soon as possible so your problem does not become worse over time and require more drastic measures to correct.